About 2 weeks ago, I was presented with this beautiful glittery white scarf as a gift from my chinese friends. I was surprised because this was my first time receiving a scarf as gift from non-muslim friends. There were two shawls, one is glittery white and the other one is in rainbow colours. Actually the white scarf is too pretty, something that I would wear to formal events such as wedding dinners or during Eid Celebrations. It was too pretty and since the nature of my work does not allow me to be so demure looking, I wanted to keep the scarf for special occasions. I had a wedding dinner to attend on Saturday and I decided to wear it. 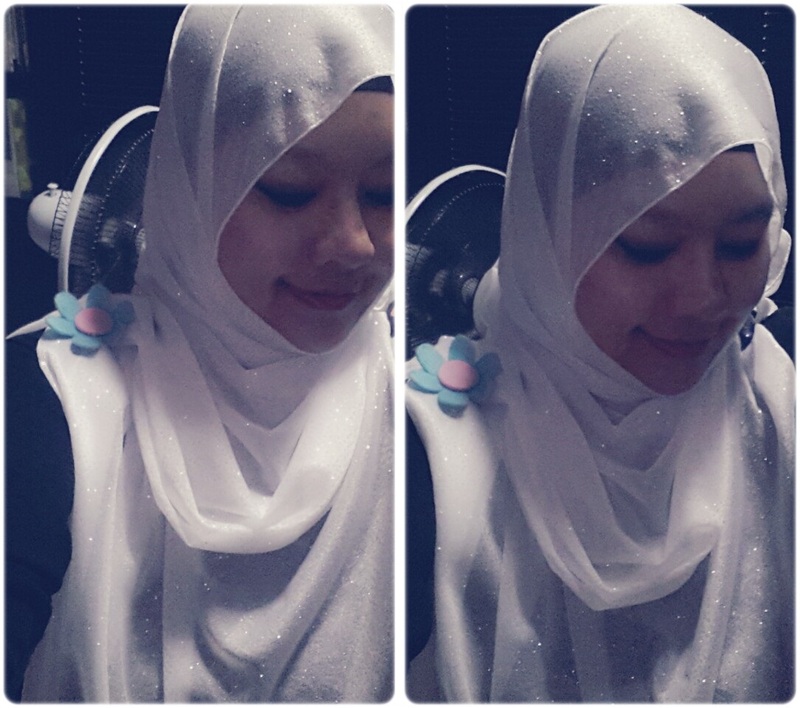 At first I had difficulties because I was not used to wearing shawls. My scarves are usually square in shape. After a few minutes, I was done! I decided to take a selfie to show Xiaomei (she was one of those who got me this!). I loved it, thank you Xiaomei! To be honest, I am too lazy to explore another style of wearing the hijab. I have been wearing my hijab the same way for the past 10 years. It will usually take me about 2 minutes or less to wear it, but if I were to change to another style, it will take longer. Recently, there have been so many new hijab styles and they even come with video tutorials! A colleague was showing it to me last week and honestly, that was my very first time watching a hijab tutorial video. The same colleague than encouraged me to try out a new style, it will be a refreshing change. And so I decided to follow her advice. I came to school today with this new ‘style’. Actually its not really a style, its just that I am wearing the shawl so my forehead was slightly more exposed than usual. 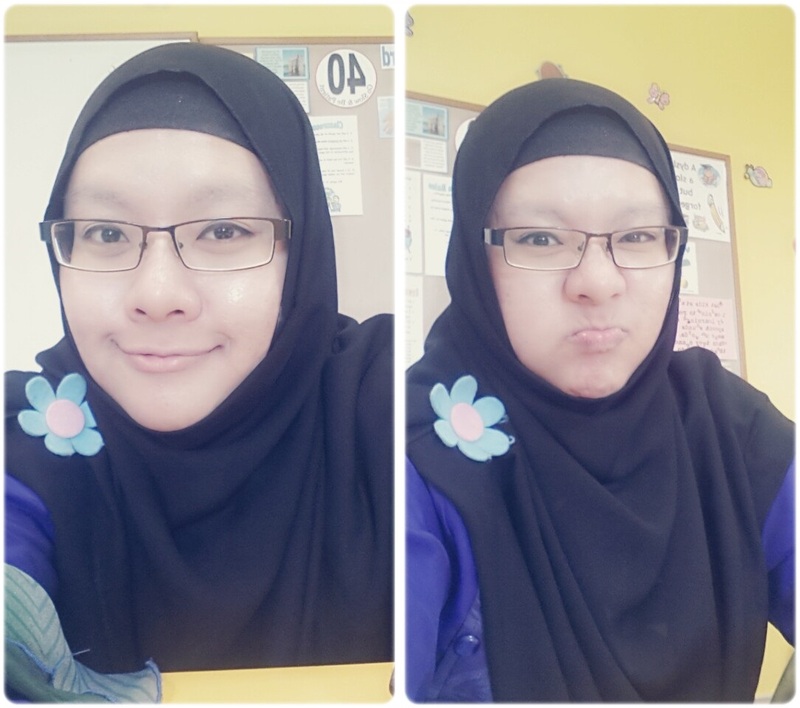 I was also in a blue jubah (long dress), something I wear when I am feeling lazy. I walked into the school sleepily and that was when it happened. Wow. It was not even 7 am. I am one who is polite so I did not really say the things I really wanted to say but inside, I was really fuming mad. I mean, isn’t it basic common sense not to say things that will anger others, especially so early in the morning? I smiled and quickly walked away before she could shoot me with any other unwanted comments. And so the day went on as usual. It was crazy busy as usual too, so I almost forgot the morning’s unpleasant incident. I was doing some photocopying and was running out of papers so I headed to the main office to get more. That was when it happened again. The same colleague was there and the minute she saw me, she stared at me even though I completely ignored her. She then stepped forward, tapped me on my arm to get my attention. I almost forgot what she said this morning. Actually, I do not really care what others think. Of course I looked different but if I wanted any opinion, I would have asked for one. I am also severely offended that this colleague said my way of wearing the hijab is not ‘modern’. What is your definition of modern? The way we dress? Isn’t that a bit too shallow? I am wearing what is required of me, I dress to please my God, not to please humans. My definition of modern is the way we think, not the way we dress. If your definition of ‘modern’ is based on how much skin is exposed, or how fashionable my outfit is, then I pity the small mindset that you have. Its shocking that in this multi cultural society and modern time, this kind of thinking still exist.